The San Francisco Labor Council and San Francisco’s Jobs with Justice were on the host committee for the Jobs with Justice national fundraiser in Washington, D.C.
At the JwJ fundraiser San Francisco rank and file workers from United Food and Commercial Unions Locals 5 and 648 were being honored for their role in our coalition that passed the first Retail Workers Bill of Rights in the United States. Our San Francisco legislation, passed unanimously by the Board of Supervisors after a year-long campaign, mandates that formula retail stores post their work schedules 14 days in advance so that workers can plan their life schedules for child care, school and other humane ways to live. This groundbreaking legislation also mandates that part-time workers who are working 24 hours a week and want to work four days a week have to be offered those extra hours before the employer hires another worker. Based on this groundbreaking victory in San Francisco this law is now being introduced statewide in Sacramento, Minnesota and other communities around the United States. The fundraiser was held at the beautiful marble-clad Women’s Museum for the Arts on New York Ave. Dinner was an informal mix of three kinds of mashed potatoes eaten in martini glasses – apparently a Jobs with Justice tradition. 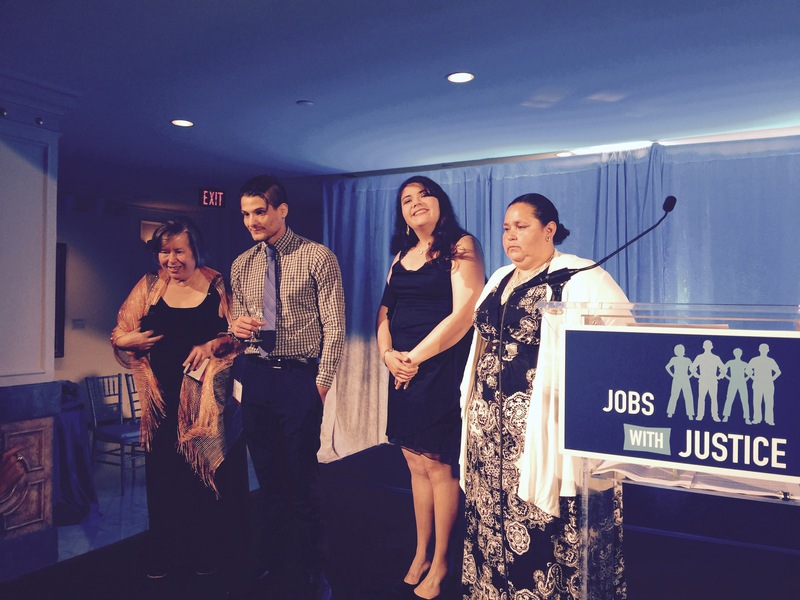 Congratulations to Julie Fisher and Mark Ortiz from Local 5 and Sandra Herrera and Michelle Flores from Local 648. They gave great comments in front of a national audience of international presidents, press, and activists. Gordon Mar and Michelle Lim from JwJ, UFCW 648 President Dan Larson, 648 representative Julissa Hernandez and I were honored to be on the stage to support them. The San Francisco Labor Council is proud of these worker-leaders that contributed to this coalition campaign. Workers and unions need to build on this victory and organize the more than 100,000 non-union retail workers in San Francisco. Addendum: Maria Elena Durazo, my former counterpart at the Los Angeles Federation of Labor, now Vice President of Unite-Here International Union for Immigration Rights, was also honored. 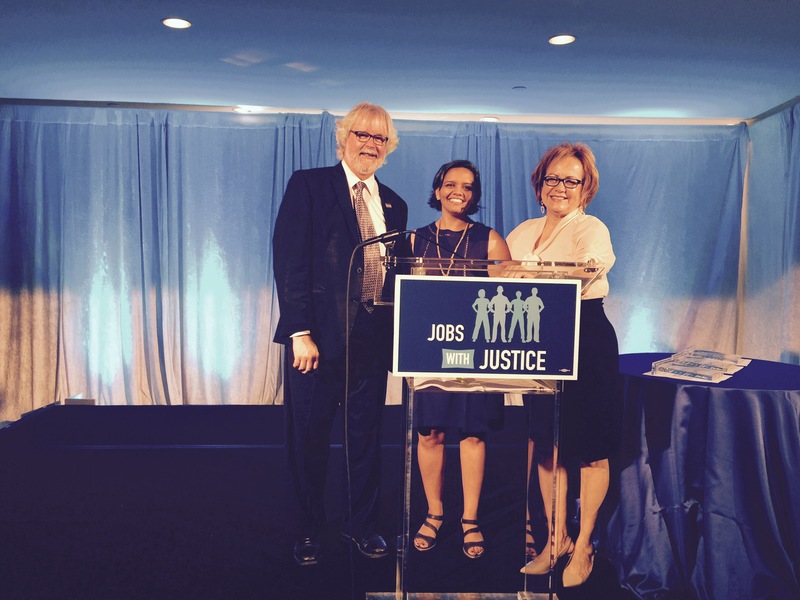 She, Jobs with Justice Executive Director Sarita Gupta, and I are in this second photo at the celebration. This entry was posted on Monday, July 20th, 2015 at 8:27 pm	and is filed under Blog. You can follow any responses to this entry through the RSS 2.0 feed. Both comments and pings are currently closed.